In the years up to 1500, Bharat built her economy to superpower status, aided in no small part by aggressive trade practices. She had reached out to some of the nearby satellite states – small, weak nations whose destinies would ultimately be decided by either Bharat or Ming – who were to become part of her mighty empire. Well, friends, it took me more than 50 in-game years to realise that accepting one of these missions gives you a Casus Belli. 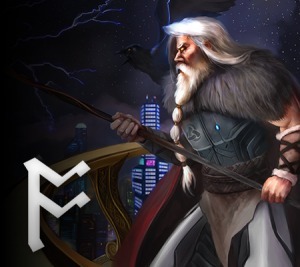 Free conquest opportunities! 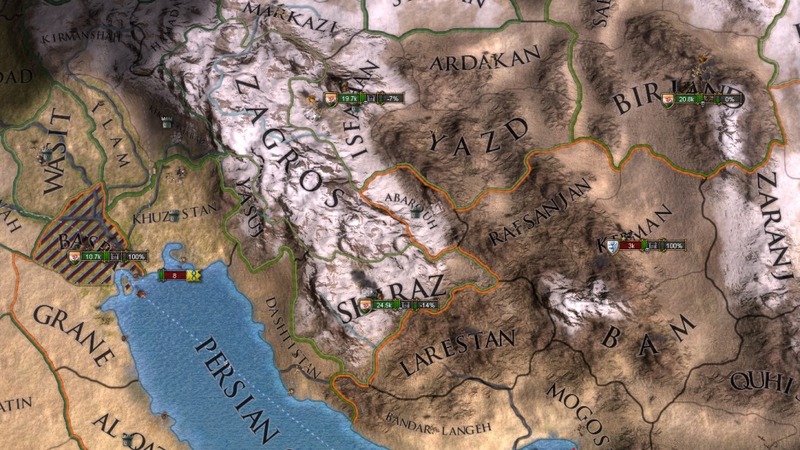 So I took the mission to remove the Timurids from the map, naturally. This is a surprising first war for any regular EU4 players, as the Timurids start off fairly strong in 1444; see the big red blob to the north-west of India in the map below. Map by /r/Jurkus1000 on Reddit. 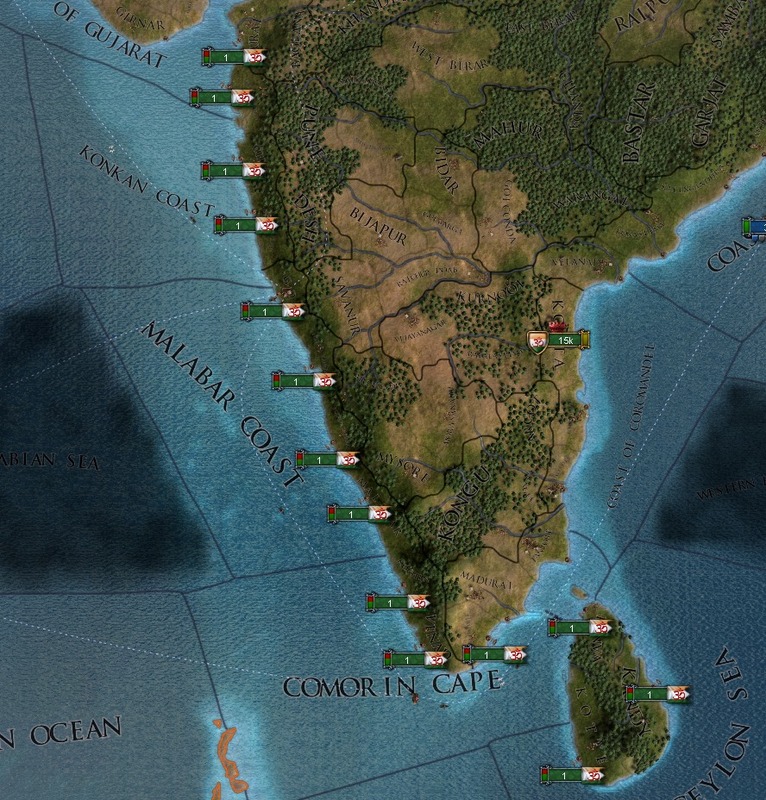 However, in this alternate history, the Timurids are but a shadow of their real-world selves, with a single province. November 1500 saw the start of the Bharathi Conquest of Abarquh. Just enough for me to dip my toes into the military side of the game. Unsurprisingly, this was a swift war, won by August 1502, and it only took that long because I had to siege the capital fortress. 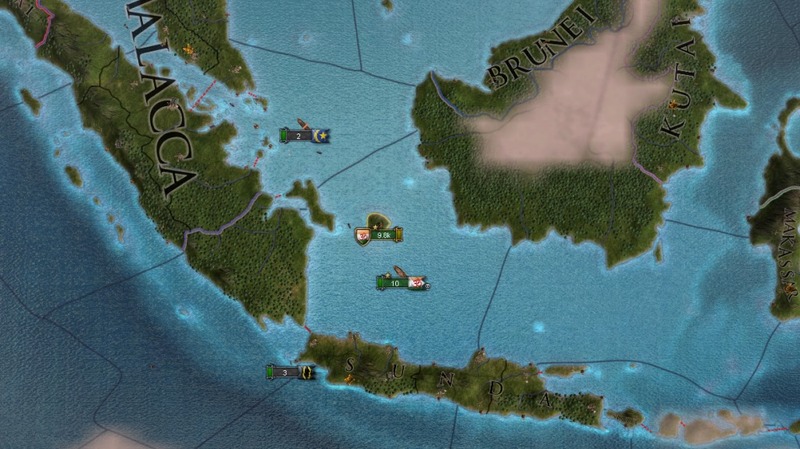 At the start of the 16th century, my Naval Force Limit is still pretty low (48), especially for a country that is supposedly going to rely on trade as a major income component and go about colonising the South Pacific. The quickest way for me to fix this – especially since I’m rolling in cash at present – is to build shipyards in any coastal province that has a building slot. I set about doing this at the start of 1502 and by January 1503, construction of my trade-busting fleet is underway. In the latter years of the 15th century, I formed a number of alliances with small states surrounding Bharat with the end-goal of vassalizing and annexing them. 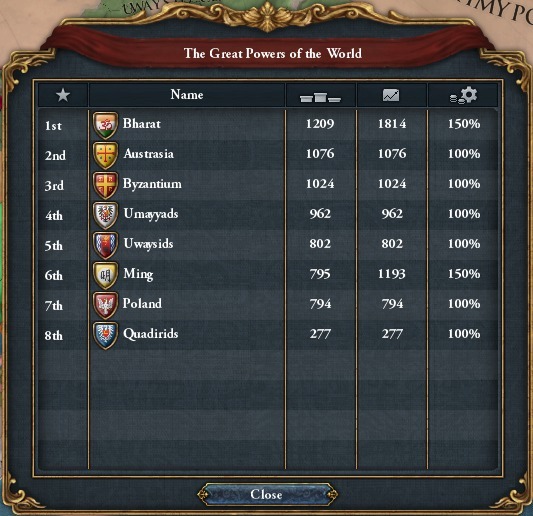 I hadn’t yet considered a mutually-beneficial alliance with another Great Power, mostly because I wasn’t convinced it would do me any good. Still, Ming was a strong military power and right on my doorstep. As they considered to exert influence across Asia, and Bharat turned her gaze to other parts of the world, I thought it prudent to form a counterbalance to that creeping power. The best option was Byzantium; we signed an alliance in July 1503. Byzantium has managed to keep a grasp on most of its empire from 769 (in the CKII portion of this mega-campaign), though has never particularly flourished – they’ve just remained there. I hope my alliance with them will act as a powerful buffer between me and Europe. February 1526 presented me with an opportunity to build up my relationship with Byzantium and earn myself a few favours. Favours in EUIV are a sort of currency that measure the extent to which an AI country owes support to another country. They can be cashed-in in later wars where you might call on your AI allies without promising them any direct gains, and you’ll similarly earn them if AI allies call you to war without promising you anything. In 1526, Byzantium decided they wanted to have a crack at the Uwaysids and their allies, who were in the lower half of the Great Powers board, with Byzantium and Bharat being firmly in the top half. Byzantium was able to deal with the Uwaysids primarily on the Anatolian plateau, which they lost towards the end of the Medieval Era. 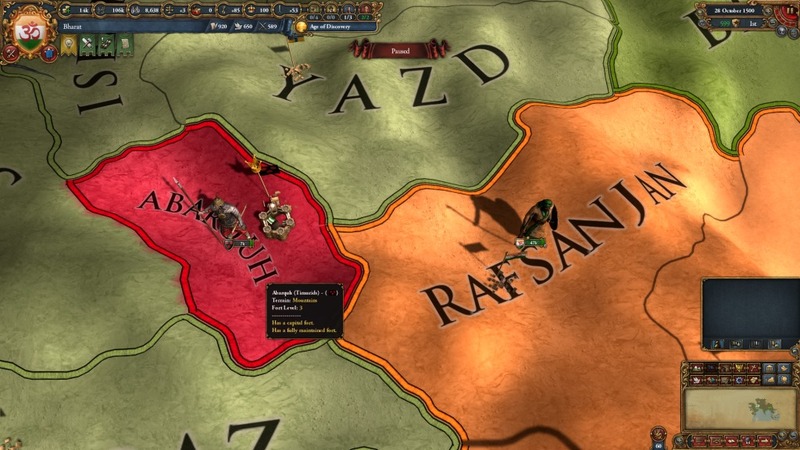 Meanwhile, I was engaging with their allies on my western border: the Bistamis, Baghdadis, and Tamimis. This was not a complicated war, and Byzantium made some decent gains whilst also doing significant damage to another Great Power. I earned myself a decent number of favours to be used in the future, should I wish, though I was happy with having weakened the Uwaysids. It was all over by Christmas Eve 1531. The war Byzantium declared was really just adding to the dog pile the Uwaysids were experiencing. They first came under attack by Ming in November 1508. Second was the Umayyads in March 1512. Byzantium and I got in a little late in 1526, but needless to say, it had been a bad 20 years for the Uwaysids who, by the way, were what was left of the Abassids from CKII. In 1323, House Mlechchha became House Adi. “Adi” is a Sanskrit word and a Hindu term meaning “the first part of reality”, related to the first cause. I chose it because this was the family that unified India, and I saw them one day conquering the world. On the 13th of November 1503, the last Adi died without an heir, and Bharat fell into the hands of the Pasai monarchy. This was a sad day, indeed, but alas – India had outgrown any one family and continued to thrive regardless. Colonization is one of the defining features of the era represented in EUIV. 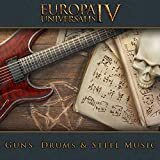 Colonization in real world history was defined by European powers – hence the game name – which is a fact I wanted to flip on its head in this alternative version of world history. 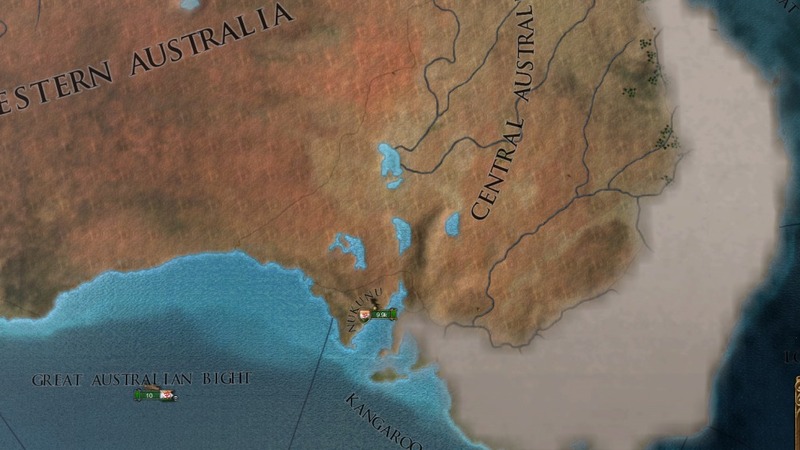 Having lots of spare cash behind me meant that I could start expanding pretty rapidly to any uncolonised provinces. 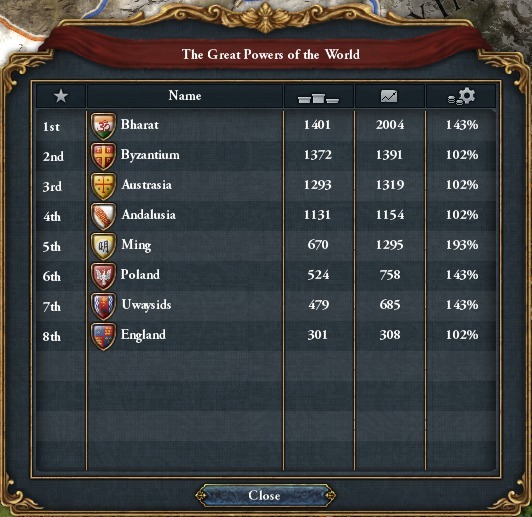 In September 1508, Bharat reached level 10 in Administrative tech, Modern Theocracy, which unlocked another Idea Group. I went over Ideas a lot in my previous post. This was my third Idea Group, after Trade and Economic Idea Groups up to 1500, and I chose Exploration, another Diplomatic Idea Group. I was sitting on a lot of Diplomatic Monarch Power, so I was able to unlock a couple of new ideas immediately: Colonial Ventures and Quest for the New World. The first gave me my first Colonist, another type of Envoy, while the latter lets me recruit Explorers and Conquistadors and reveal terra incognita. My first colonist was sent to Belitung in Malacca on the 5th of December 1509. 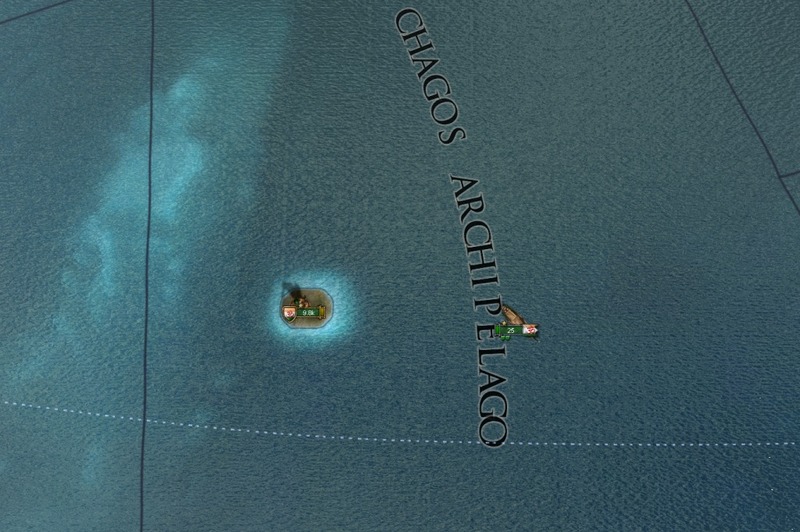 Not long after this, I assembled a couple of fleets headed by Explorers – and holding armies lead by Conquistadors to explore land – to start discovering new colonial destinations. The first discovery was Diego Garcia in the Chagos Archipelago. From there, I committed to exploration of both the east and west simultaneously – the South China Sea and the Western Indian Ocean. It wasn’t long before I’d discovered most of Australia and had my first self-sustaining colony (Belitung, January 1520). As for Australia and New Zealand – they received their first colonists in 1544, and represented the first great colonial opportunity for Bharat. As I explained in the last post, Bharat was a bit behind when it came to institutions. 1511 saw the birth of Colonialism, and I still hadn’t managed to embrace the Renaissance institution! 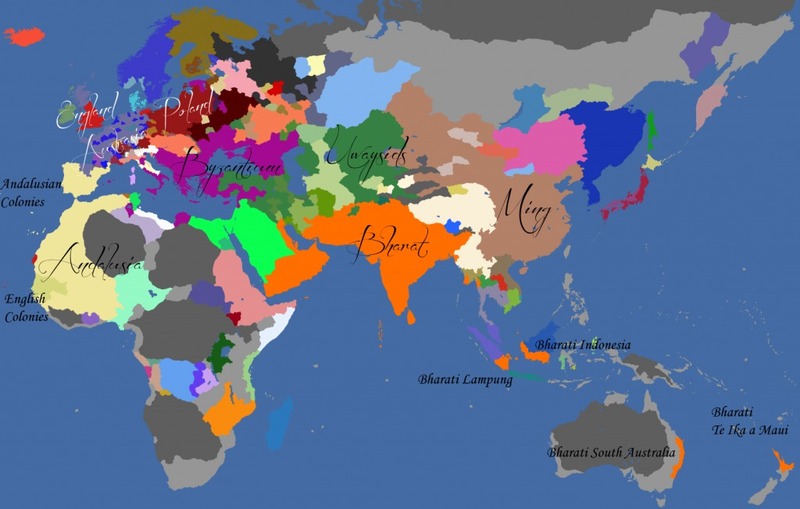 The Age of Reformation arrived in 1523 and Bharat finally embraced the Renaissance in 1533. Technologies were becoming pretty expensive by being two institutions out-of-date. I hope that an institution will soon spawn somewhere closer to home, and not always in Europe! It takes a long time to spread to this corner of the globe! While I continued to make efforts to grow my monthly income – through trade and other means – I also found more ways to spend that income, namely war and, more constructively, colonization. 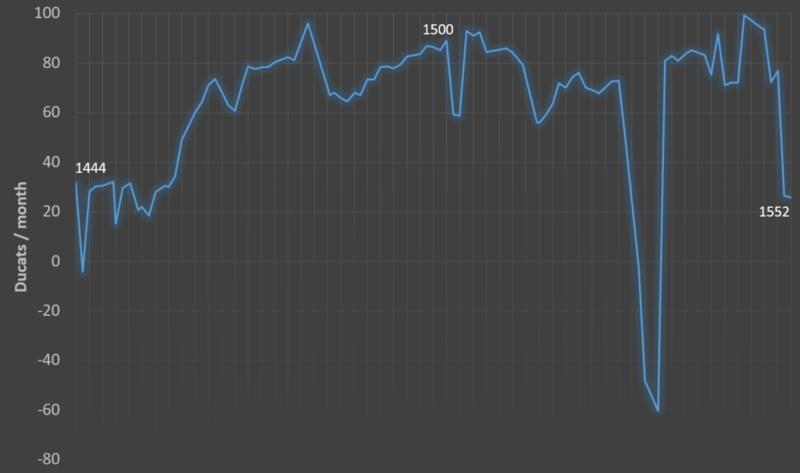 This chart shows a deep dip in the years between 1528 and 1532, which was during the Byzantine Reconquest of Hamid. There’s another dip towards the end in 1552; it’s still positive income, but represents a doubling of efforts in colonization. Increasing the number of colonies you’re trying to grow similarly increases colonial maintenance quadratically, so it can get expensive quickly. 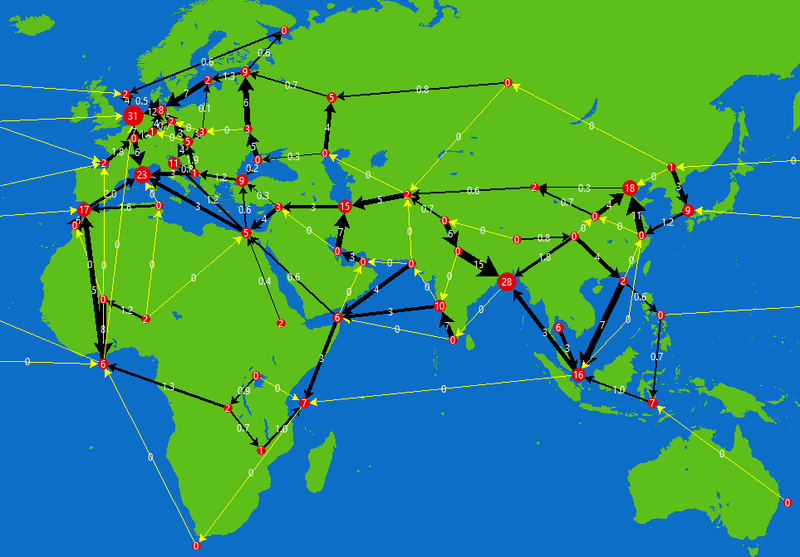 In 1500, Old World trade looked like the below. The most significant growth can be seen in the Bengal trade node, which has grown by 35%. The English Channel is still the most valuable trade node, but only just, having grown 26% in 52 years. The growth in Bengal has been largely due to increased wealth flowing from Malacca due to more light ships protecting trade in that node. 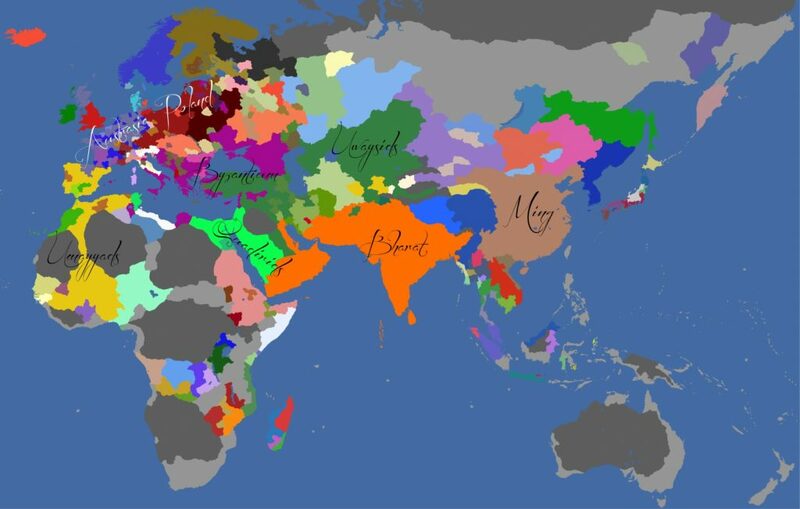 These maps were generated with the EU4 Trade Visualizer by Junuxx. This tool allows you to examine your save files for this sort of trade data. I’m still behind in institutions, so suffering from tech penalty. The top half of the leader board is otherwise not much different. Andalusia has formed from the Umayyads. The Uwaysids are now significantly weaker, though still strong enough to be on the Great Powers board. The Quadirids have been replaced by England, which, of course, was a strong colonial nation in the real world. The Old World has changed! Old World map showing the Great Powers of 1552. Most of the Great Powers have continued to grow, in some way or another. Andalusia looks like it’s grown a lot, but that’s mostly wasteland in West Africa. Austrasia continues to consolidate territory in Western Europe, being mercifully balance by Poland’s gains in Eastern Europe. Byzantium has grown after the joint war against the Uwaysids, who have largely lost out to that and Ming’s advance from the east (which has granted it a lot of territory). The world is starting to see its first colonies. Bharat has spread across the South Pacific and has a foothold in Australia. England has colonized Cape Verde and Arguin, two provinces in West Africa, much to Andalusia’s annoyance, I’m sure. Andalusia, on the other hand, has colonised The Canarias, Madeira, and The Azores. Not seen in the Old World map is the first colony in the Americas: Andalusian Hispaniola in present-day Dominican Republic. England and Andalusia will obviously be influential in the Americas, so I’ll keep an eye on them! I’m going to continue spreading my influence in the South Pacific and keep an eye on the other colonial nations. 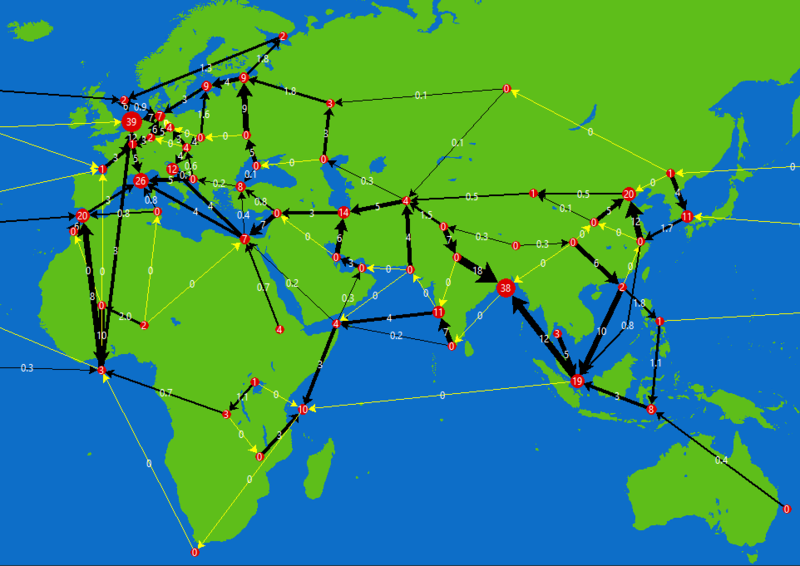 Meanwhile, I’ll think about my diplomatic game in Southeast Asia and the Middle East, which are likely to be flash-points for Great Power conflicts.